THIS PROJECT IS UNDER CONSTRUCTION, CLICK HERE TO VIEW DAYS 11 – 14 IMAGES. The client has requested that the curved rising black sleeper shrine at ground level be raised by 1 meter so the garden structure is visible from the higher seating area. A work change order form has been filed and signed by the client to authorise the change, this is quoted for and accepted, we are happy to alter our designs at any stage if you are happy to pay for the additional materials and labour. The higher level seating area has been marked out for the paving. 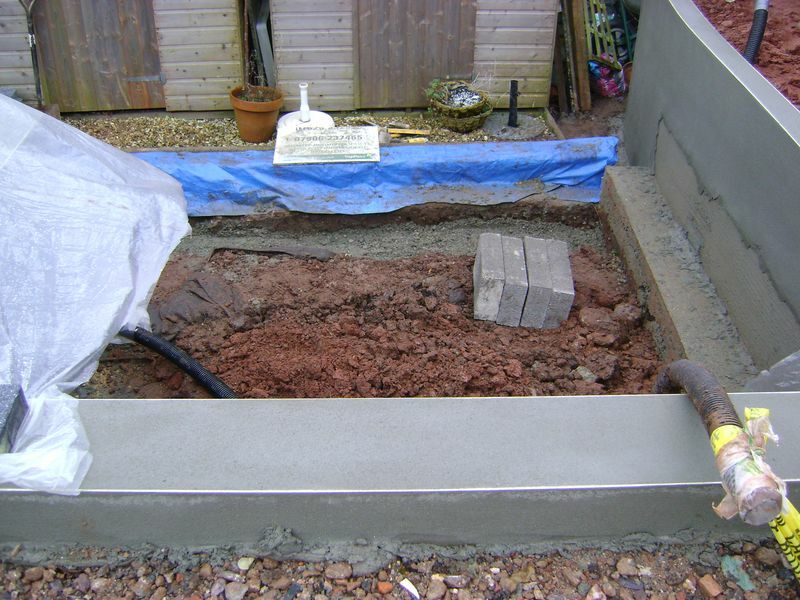 The sleepers are jack hammered out of the concrete and stored for later use. The ducting for the base of the sleepers is adjusted. New footings have been cut and concreted and the additional nine inch block work installed to the correct height. Weep holes have been extended. 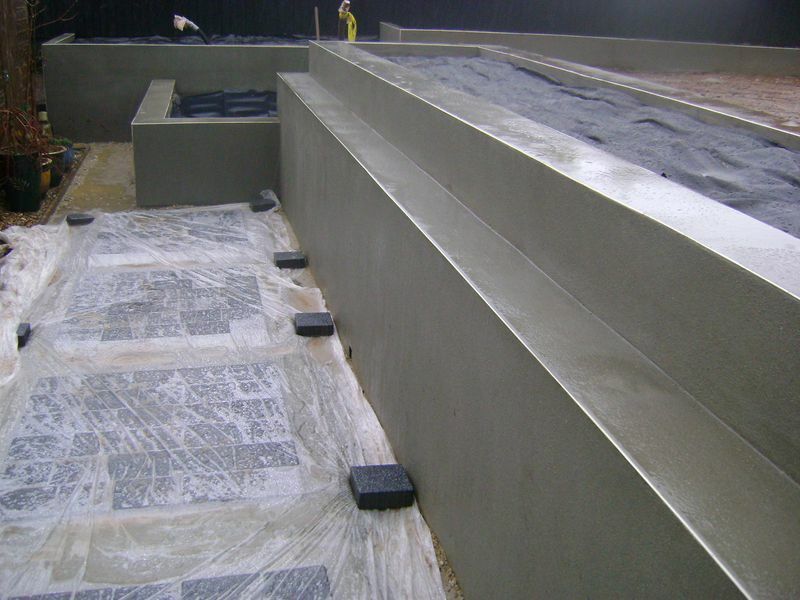 Render continues to be laid on the walls, all render mixes have the rapid cement hardener included. The build to the new raised shrine area has been beaded, scratch coated and rendered. The sub base to the lower footpath has been installed to the correct falls and levels. 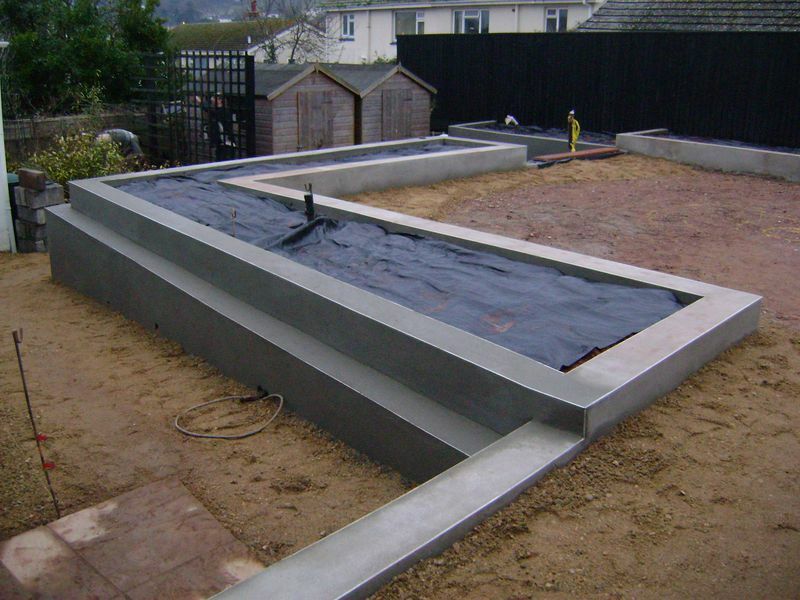 The sub base to higher artificial lawn has been installed to the correct level. All render works has been completed. Works begin on the bespoke trellis to screen the sheds from the house, the trellis will be painted black. 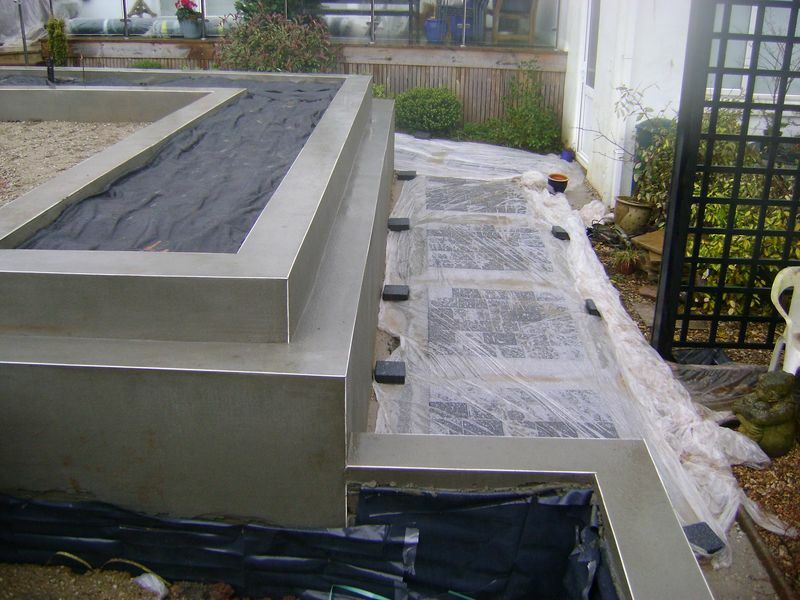 All the top soil to the planters has been leveled to 80mm below finish level. 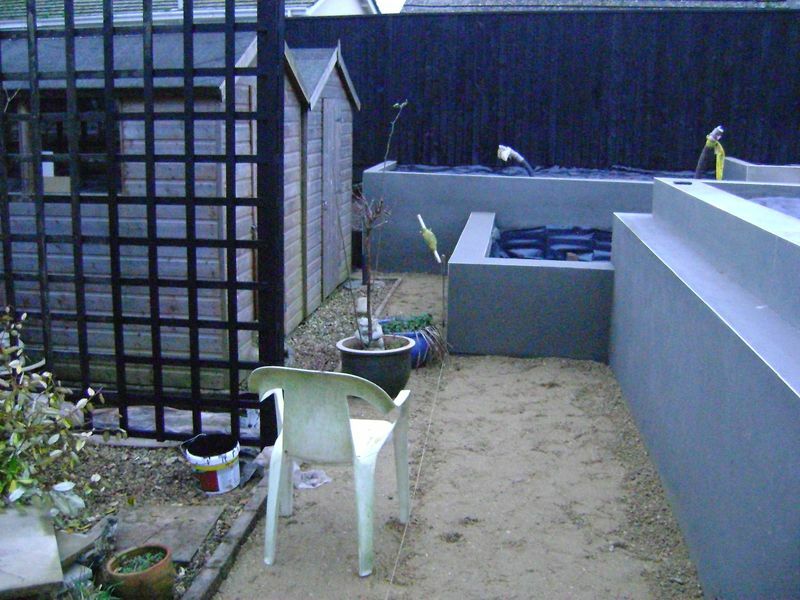 A weed suppressing membrane has been cut and pinned in place over the top soil in the planters, the base of the perimeter fence has been touched in with black paint due to splash back from the rain. A second coat of black paint is being applied to the bespoke trellis works. Every 150 x 150mm pitch to the trellis work has a 40mm screw inserted to the centre and works continue with applying the paint. All the Tobermore Sienna Graphite block paving is brought by barrows from the front driveway landing point to the rear of the garden and loaded out in the two separate sizes. I ensure that the Tobermore blocks are covered with polythene as the skin on the hands will wear down quickly if the blocks are wet, causing what known as birds eyes. Four passes of a compactor plate consolidates the sub base, 40mm of 50/50 course sand is barrowed into place, raked and leveled and the wacker plate is passed over three times. 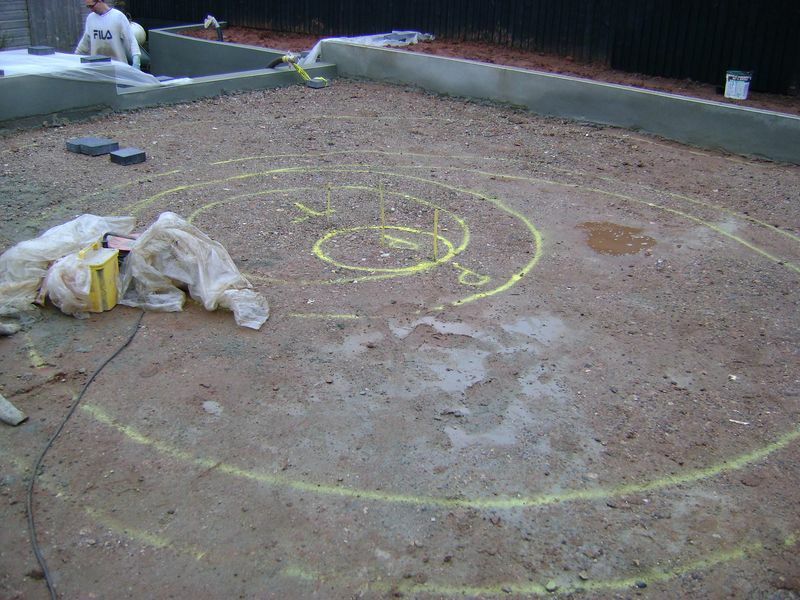 The center line to the paved area is sprayed at each end and a road pin and string line used to ensure the correct falls and levels are in place. Knowing the sizes and quantities of the block paving stepping stones, calculations are made to ensure even spacing’s between each pad, in this case 370mm. The block paving is installed on the screed ed sand making sure there are no running joints. Kiln dried sand will be installed at a later date to tighten the blocks. 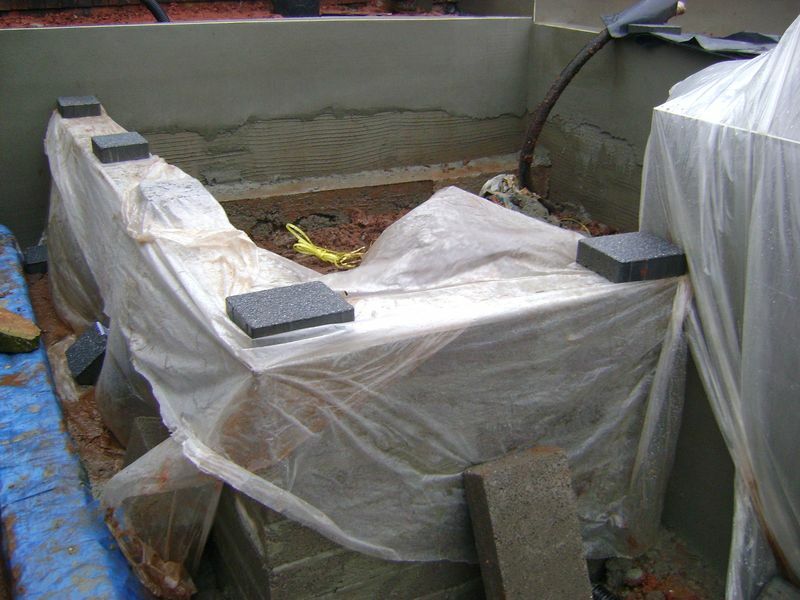 A perimeter of concrete is applied to each stepping stone and haunch ed to a level of 25mm below the finished surface level, this concrete will secure the blocks in place. Each block paved stepping pad is scrubbed with a still brush and cold water, this cleans all the off and is now ready for the jointing sand. 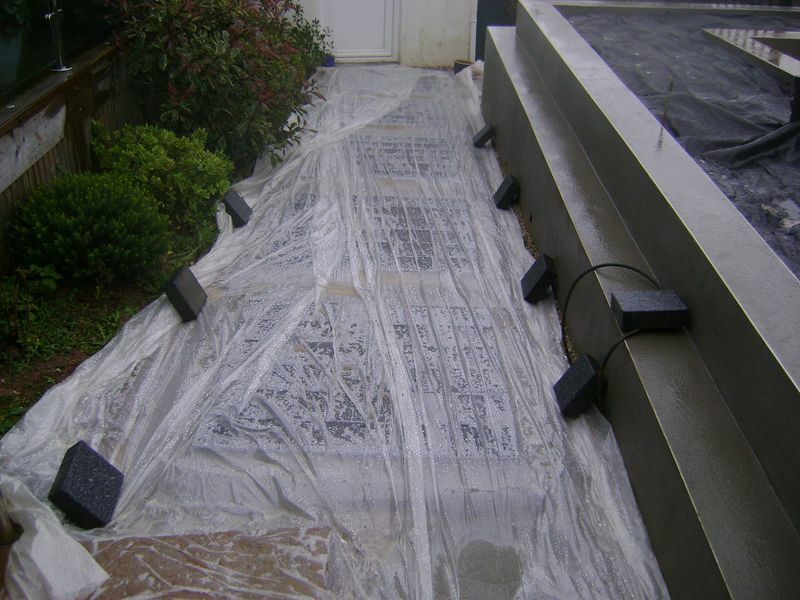 Clean light weight general purpose polythene covers the entire area to allow the concrete to go off with out the rain washing it all away by the morning.